This photo is a famous towers in Tokyo “Tokyo sky tree”. Height is 634. Opened in 5/22/2012. Japan old technology is used in the “Tokyo sky tree”. Is using technology built in Nara “Gozyunotou” is a 1000 years ago. Go to the “sky tree” If you come to Japan. Posted on June 3, 2012 by gjveep	• This entry was posted in Kogyokusha Boys School. Bookmark the permalink. 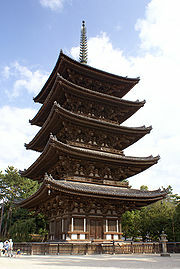 Is this the five-storied pagoda of Kofukuji Temple? The other day, I　went up to the Observation Deck, of this tower, Sky tree, which is as high as 450m above sea level! The view is so beautiful. I went up this tower 7/10/2012. This is a very majestic building. In Ghana, we also have beautifully inspired buildings such as yours like the national theater in Accra.